I love October. It is one of my favorite months. The humidity is dropping, the leaves are changing colors and there’s a whiff of autumn in the air. I also love October because for more than 50 years it has been set aside to officially celebrate Cooperative Month, when we focus on recognizing the principles and philosophy of cooperatives. 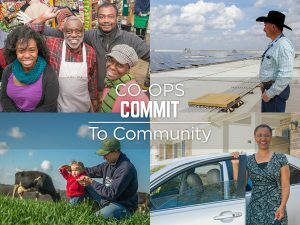 The 2017 theme for Cooperative Month is “Cooperatives Commit.” And we do commit to the communities we serve. WK&T, and many cooperatives like it, started organizing and building in the early 1950s. Some started even earlier. Rural residents had a shared need and they worked together to solve it. Hometown and community leaders knocked on doors, asked for signatures and laid the groundwork for rural areas to have electric and communications services. Communities worked together to ensure connectivity was made available to places no one else wanted to go. Strong ties were created as everyone worked toward the same goal, creating something together they could not achieve alone. Although the concept is similar to a corporation with stockholders, in a cooperative everything stays local. It’s really about neighbor serving neighbor. It is concern for community. It’s about having the choice to live where you want to live. The strongertogether.coop website says it best. The site describes cooperatives as providing the opportunity to get the products and services you want and need while making the surrounding community stronger. I wholeheartedly believe in their explanation. I love that my cooperative has built the infrastructure that gives me a choice. I have the choice to live in a beautiful rural area, to enjoy the quiet of my front porch while also using Skype to chatter with my granddaughter across my high-speed internet connection. Cooperatives made that happen for me and my family. It’s like having your cake and eating it too (without the calories). If you don’t believe me when I say how “cool” cooperatives are, consider these facts that I gathered from various sources. * There are 29,000 cooperatives in the US representing 350 million memberships, 850k jobs and $74 billion in annual wages. * 260 telephone cooperatives serve 1.2 rural Americans in 31 states. * Telephone cooperatives serve about 5% of the nation’s telephone subscribers, but their areas cover more than 40% of the United States land mass. That’s a lot of country roads and wide open spaces. * More than 1,000 electric cooperatives cover 75% of the land mass in the US and serve 42% of the nation’s customers. * Two million farmers are part of 3,000 farmer-owned cooperatives. * There are 8,300 credit unions, which are cooperative organizations. * 233 million people are served by insurance cooperatives. * Don’t forget about food cooperatives. They are gaining popularity across the country. Visit http://strongertogether.coop or www.foodcoopinitiative.coop for information. For a directory of food cooperatives in the US, visit www.coopdirectory.org to find one in your area. Celebrate with me in October. I hope you will take a moment to reflect on the history of your local cooperatives. Count the number of cooperatives you are currently a member of. Enjoy and appreciate that you are not only a part of history but, more importantly, the future of your community.